Hello Beautiful Stitchers! Where are the weeks disappearing this year? I can hardly believe it is the beginning of March already. There are lots of exciting things happening here at the moment. I am so busy that the weeks just feel like they are flying by. I’ll be able to reveal all soon, but in the meantime I want to finish off this series on choosing colours with confidence. I really hope you have found that inner child and started embracing your colour style with energy and enthusiasm! In Part 1 and Part 2 we looked at some examples of how I use variegated threads to help me choose colours. In this post I wanted to collect together some resources and examples of other avenues you can try when you need colour inspiration. The most obvious of course is to use a piece of fabric as your starting point. If you are anything like me you have a wonderful stash of fabric, and each and every one is another colour palette just waiting to be tried. (Of course, if you can’t find just the right colour in your stash, then you are just going to have to go shopping – sounds like the perfect excuse to me!). Take the time to stop and look at your fabrics in a slightly different way. Look at the colours the designer has used and how are they balanced. Will that help you with the embroidery project you have in mind? Here is a random example from my stash. 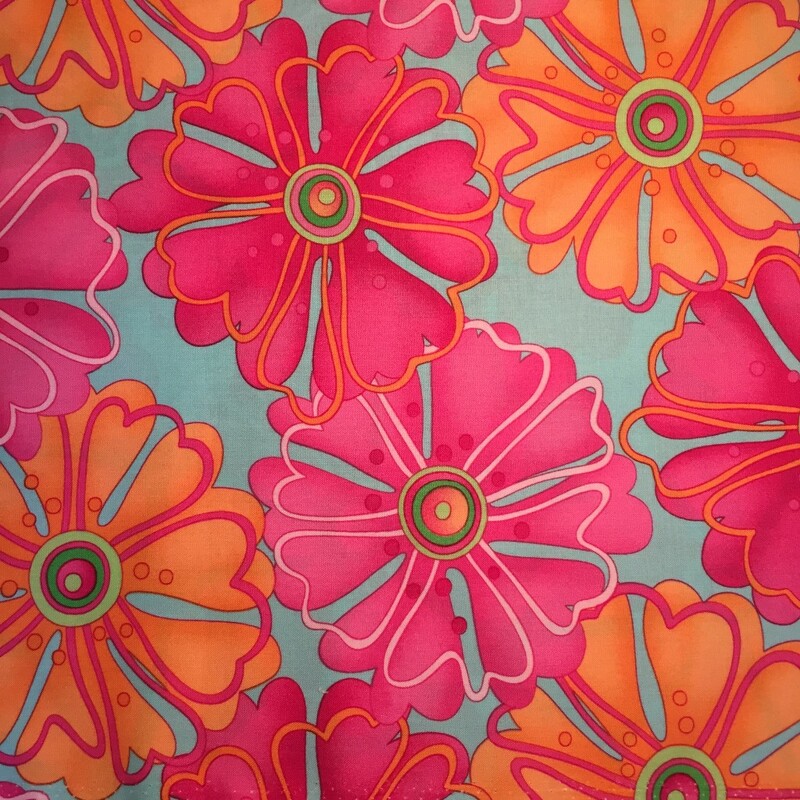 This bright, bold, floral print has as its lead character PINK. But there are a number of shades of pink here, so perhaps a variegated thread would be a good choice. Supporting roles are played by ORANGE and TEAL, and importantly there are bit parts for two shades of GREEN. To select my threads, I would simply take this piece of fabric to my local needlework shop and use it to help me choose the right shades of pink, teal, orange and green. Using the piece of fabric as a starting point makes the colour choice much easier. Ok – let’s look at another example. I worked this set of embroidered braids a number of years ago and I still have the piece of fabric that I used to help me choose my colours. This fabric design is a lot busier than the bold floral above but it turned out to be a superb colour resource. First, you can tell overall that the colours of my piece are similar to the colours of the fabric. Just as I suggested above, I took this fabric to my local needlework shop and selected a range of DMC cottons, some beautiful silk threads, and a handful of mohair threads for my colour palette. But then I went one step further. I used individual elements within the design to help me choose colours for each braid. In this example the leaf element is predominantly the lighter shade of green with supporting roles played by the darker shade of green and gold. And there is just a hint of russet red right at the outer edge. I chose the colours for the braid to reflect that mix. What about another example? This leaf has a deep russet red alongside a very light cream. The highlights come from yellow, black and blue. The braid I created left out the black because I just felt like it made my design too heavy, but otherwise the colour palette is drawn directly from that little leaf. Can you see how easy it is? And what great resources you almost certainly have in your stash already? Did I hear you say that you don’t really buy fabric because you are an embroiderer through and through? No problem. What about magazines, or books, or artwork, or photographs? I am sure you have some of those. And they are all WONDERFUL resources for colour. For example, here is a beautiful magazine cover (I confess to having a weakness for good quality craft magazines). Colour and Design for Embroidery by Richard Box – an excellent technical resource with excellent information on each of the main colour hues. A Passion for Colour by Ruth Issett – a feast for the eyes. Ruth’s enthusiasm for colour is contagious! 2000 Colour Combinations by Garth Lewis – a fantastic library of colour palettes. Colour Confidence in Embroidery by Trish Burr – a wonderful book that shows you colour palettes in action in embroidered motifs. Paletton – The Color Scheme Designer – an online tool for designing colour palettes from any starting point. It is very easy to use for a specific purpose or just to go exploring. COLOURlovers – a seriously mind-boggling array of colour palettes, which can almost be a little overwhelming at times. But it is worth a visit to go exploring and find the amazing number of colour palettes that are possible. Also, many of the palettes are laid out with the colour balance as well, so this is a really helpful feature. TinEye Labs MulticolorEngine – a seriously fun tool to choose a range of colours and then see a whole suite of images using those colours. 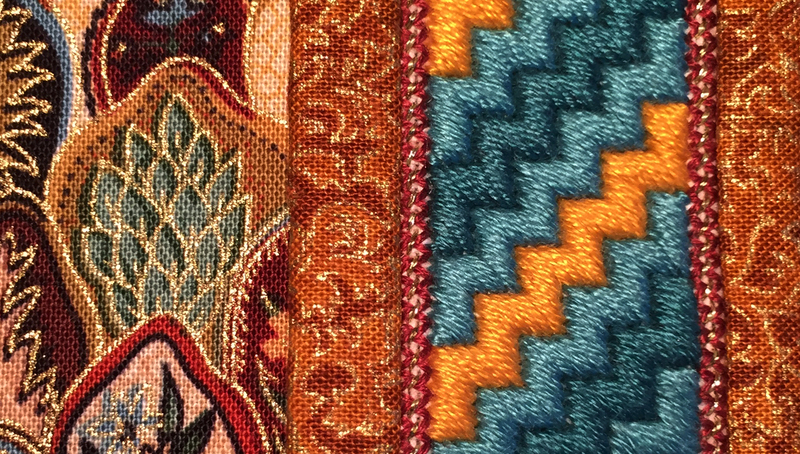 It is kind of colour palettes in revers, but it gives you a really good feel for what your embroidery might look like if you choose a given set of colours. Please use the comments below to let me know what you think. Do you know of other great colour resources that I could add to the list here? It is always brilliant to hear from you! Hello beautiful stitchers! Welcome to Part 2 of choosing colours with confidence. 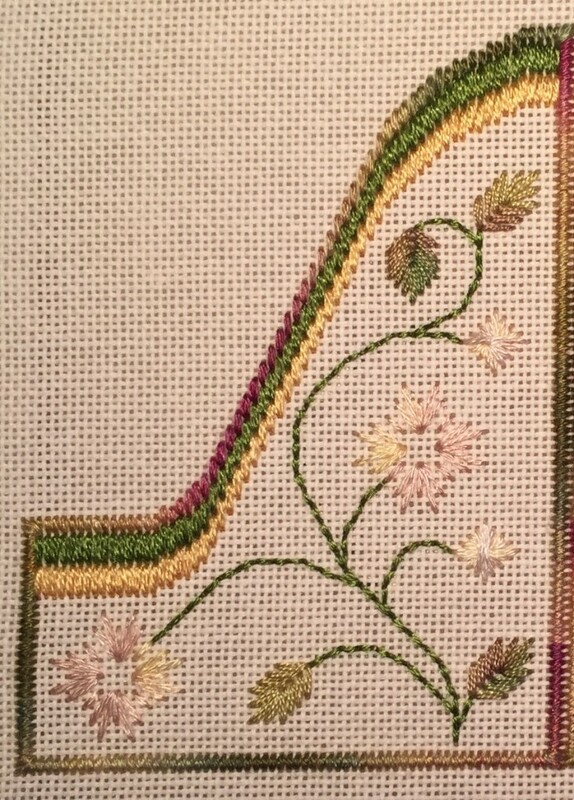 Remember in my last post, I showed you how I use variegated threads as a starting point for choosing a colour palette? I was working with some new students last week and they loved this idea. But what if you have a very specific colour or colours you want to start with? How do you go about it then? Well it is exactly the same, only you turn the process around a little. Let me show you an example. I started work on a new project last October. I had a very specific design inspiration in mind and my starting point was yellow and green. So I chose two shades from the Au Ver A Soie range – 2533 and 2125, which were just right. 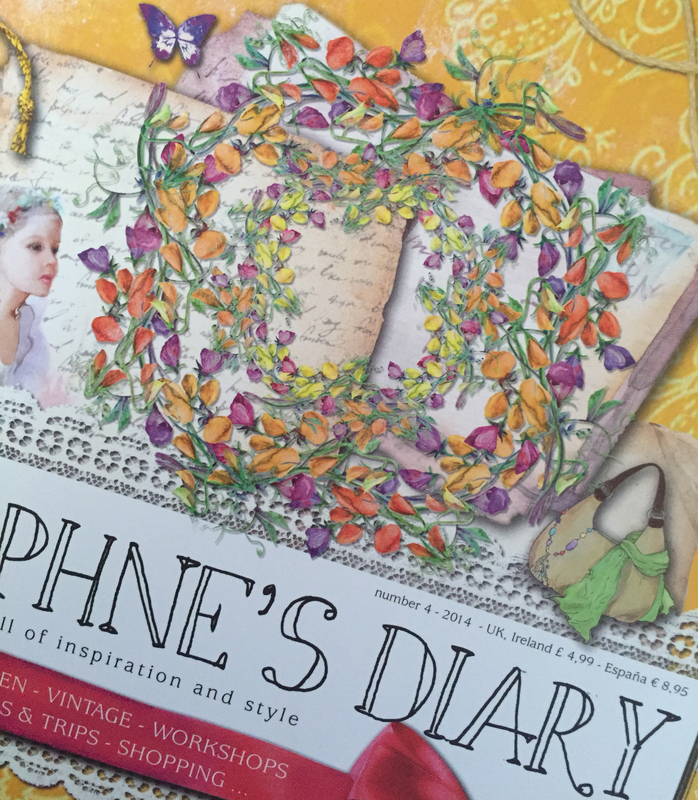 Au Ver a Soie silk threads – my starting point. But I needed to extend the colour palette to develop my design. 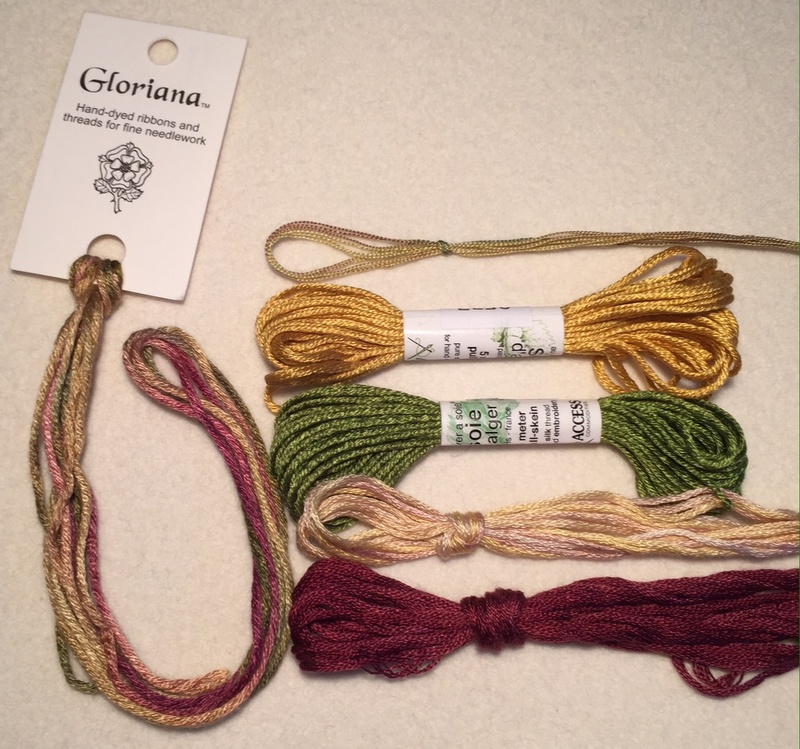 I went to my stash of variegated threads and found a beautiful Gloriana silk, #194 – Flowers of Italy, which included just the right shade of green as well as a more muted yellow and a beautiful dark pink. I also found another silk thread, Spiral Dyed – River Gum, which once again had just the right shade of green, but this time mixed with a range of other greens and earthy tones. A third variegated thread by Dinky Dyes, 46, looks like just a creamy neutral, but actually includes very light shades of just the right yellow and pink. And I happened to have the perfect dark pink, also Dinky Dyes, 132, in my stash too (I do have rather a lot of threads). 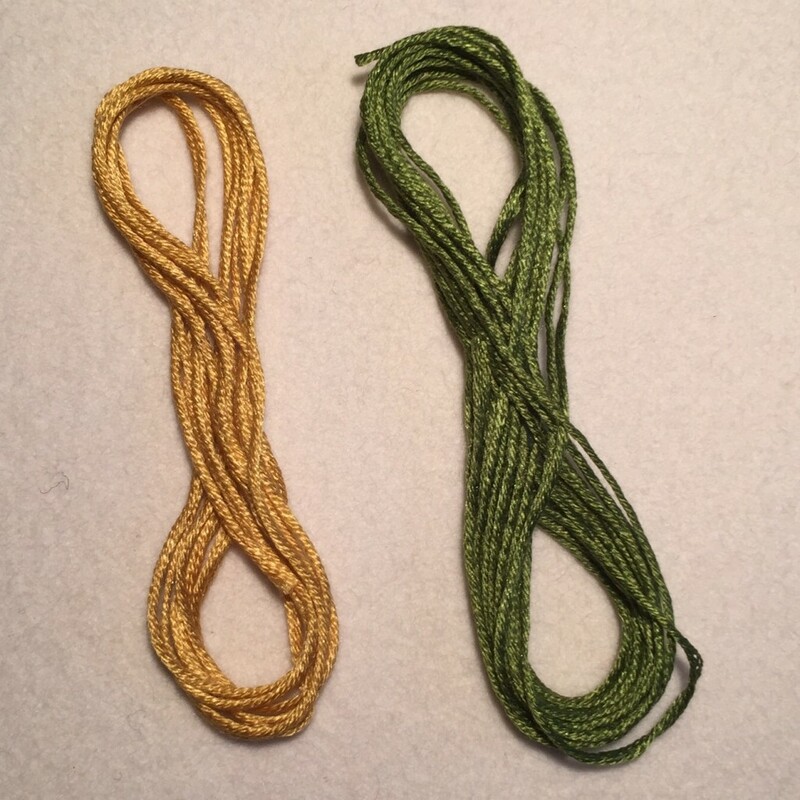 The original green and yellow threads with four extra threads added to extend the colour palette. So my colour story was starting to extend here – the original bright yellow and green colour scheme, now included a range of greens, a deep pink, cream, very light pink, very light yellow, and a dark pink. 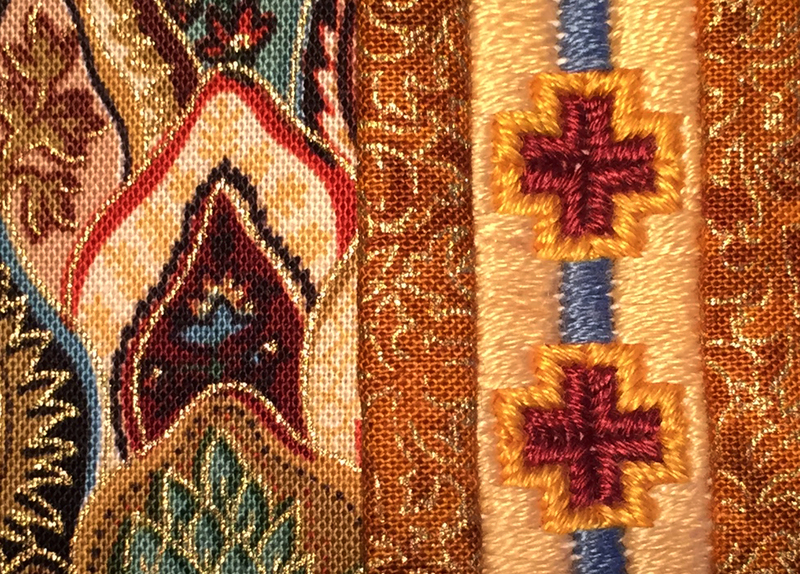 I started stitching (there is nothing quite like the excitement of working a new design, especially when the threads are all silk – bliss!). The Spiral Dyed green thread was perfect for leaves whilst the Dinky Dyes pale cream was making the most beautiful flowers and buds. 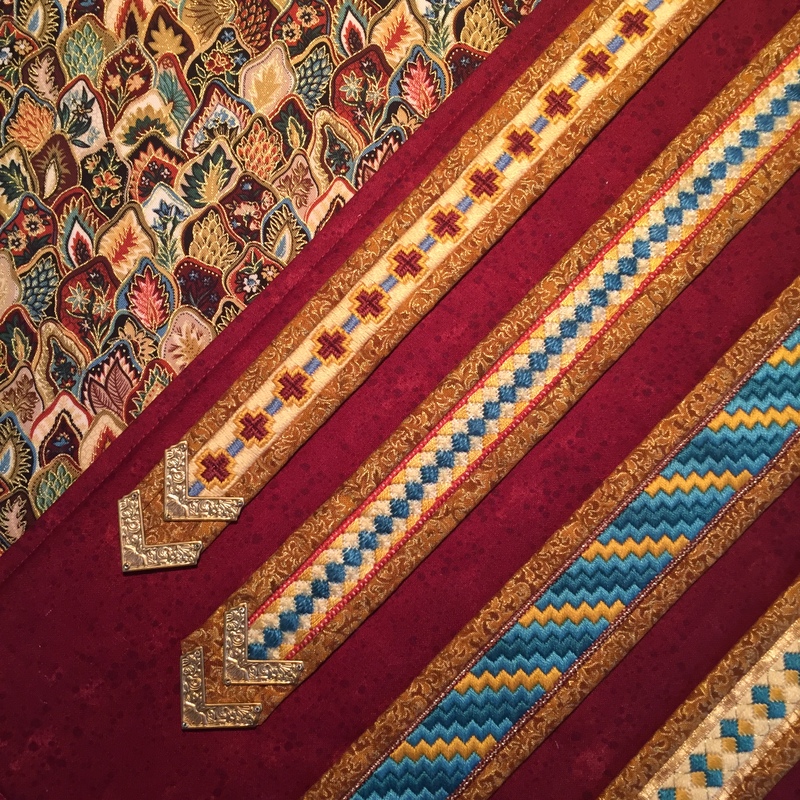 The variegated Gloriana thread was anchoring the borders and the original green and yellow silks were starring in Bargello style curves. Design well underway with the selected colour palette. But the overall effect was flat. It wasn’t singing to me yet. What could I do? 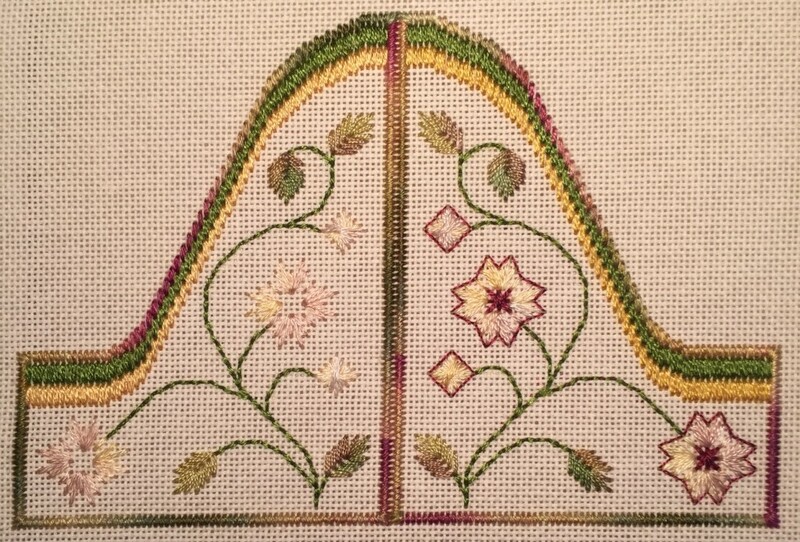 Enter the dark pink – just one strand backstitched around the flowers and the buds. Just look at the difference! That touch of deep pink lifted the whole design and made it sing with joy. I can tell you that I was dancing around the room with excitement when the colour story began working so beautifully. Look at the comparison between the left and right sides of the design. Adding just a touch of deep pink makes such a big difference! What was really happening here? Well, the variegated threads had helped me to choose a lovely, coordinated colour palette. 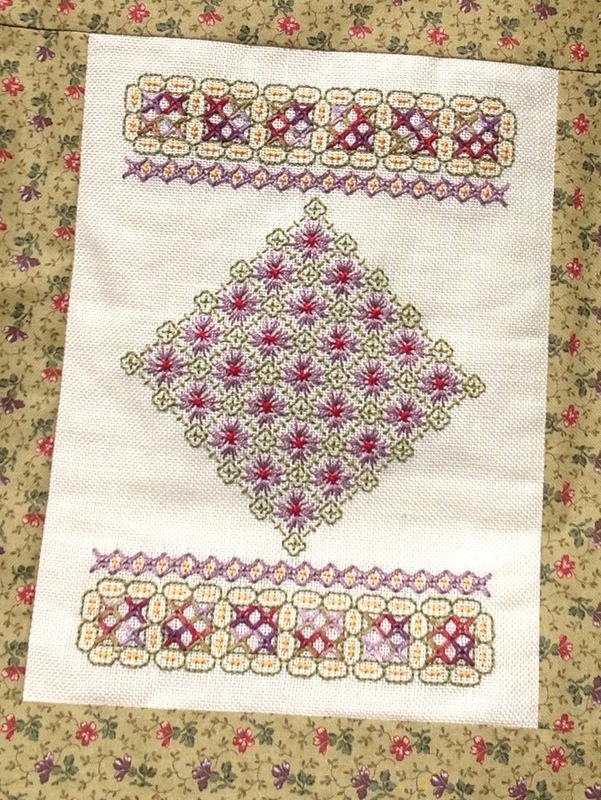 But as I stitched the design, the dark pink was only appearing in the borders and so most of the design lacked contrast. Contrast is the visual property that allows one object in a design to stand out from another. In other words, it is easier to distinguish different elements in a design or image if they have clearly different colours and brightness. The dark pink outline introduced just the right amount of contrast into my design so that each flower and bud stood out just as much as the stems and leaves. Let’s take a look at another example. One of my favourite colour combinations is purple and green (you can even see that in my logo :)). 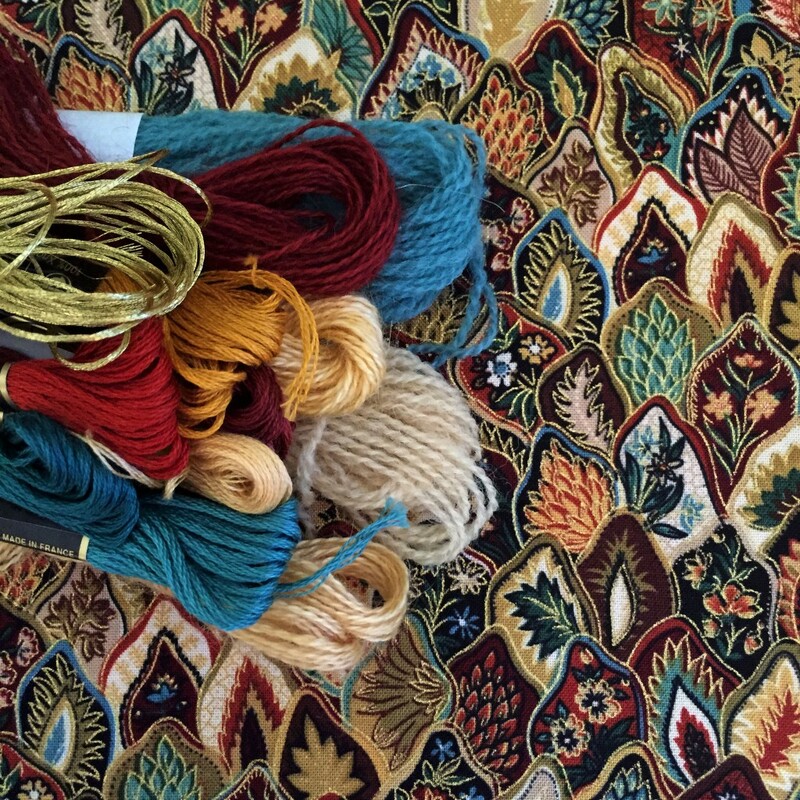 This variegated silk thread, Spiral Dyed by Rae Cummings – Persian Carpet, is the most beautiful combination of rich purples, reds, and greens. I LOVE it and have used it in countless projects. One of these was a pretty Wessex Work bag with matching A4 journal cover and pencil case. I decided to use the variegated silk for just one element in the design and then selected coordinating cotton Perlé threads for the rest. If you select one shade of each of the red, purple and green you get a beautifully coordinated colour palette, and actually the contrast between the pale purple and the richer red is pretty good. A lovely red, green and purple colour palette. But I like a little bit of sparkle and zing in my designs, so I needed one more colour to add some extra contrast. I chose yellow and whilst it looks a little garish when you line up the spools next to each other, just a small amount of yellow in the final design is enough to give it a beautiful lift. Wessex Work embroidery on the front of a shoulder bag. Just the touch of yellow adds a little extra sparkle to the design. “OK”, I can hear you saying. “But you didn’t have a variegated thread or anything to guide you this time. How did you know to choose yellow?”. Well the answer is that I didn’t. I just knew I wanted to add an extra colour to my chosen palette. I stood in the embroidery shop trying a whole range of colours until I decided that the yellow would be just right. This is the point where you have to just start trying things for yourself. LISTEN to your heart and let that five year old colouring-in voice shine through. Choose the contrast colour that you like and try it. And if it doesn’t quite work, don’t get down on yourself – instead learn from your mistake and try something different next time. The more you choose your own colours, the better you will become and the more colour confidence you will feel. If I had a dollar for every time a student said to me “I’m no good with colour”, I would be a rich woman! Well, I am here to tell you that I was that person too – perhaps as little as five years ago. And yet one of the most common compliments I receive about my embroidery designs now is “I love the colours you have used “. In just the same way as you learned to ride a bike or cook a cake, you can learn to make your own beautiful colour choices. It just takes PRACTICE. And I PROMISE you, that if I can do it (a former colour-choice phobic and card-carrying member of the “I am not creative” society ), then you can too! A number of years ago we wanted to replace the rug in our living room. The old rug was predominantly red in a typical Persian-style. It toned very nicely with our red armchairs, chocolate brown sofa and warm reddish-brown bamboo floors. So, we headed off to the local rug shop with my daughter, Samantha, in tow. As we browsed through the store, my husband and I were drawn to red rugs much like the one we had already – safe, conservative choices. Samantha’s preferences were completely different. I want you to imagine a small, blond-haired girl at the ripe old age of 7, ADAMANT that we needed to purchase a predominantly green rug highlighted by an abtsract cream design. I watched her walk around the shop, instinctively saying “no”, “yuck”, and “boring” to our choices, and yet as soon as she saw the green rug she was absolutely convinced that it was “perfect”. Initially I worked at negotiating with her to bring her around to our point of view, but I pretty soon saw that she was not to be moved. And I got to thinking, “Maybe she’s right. Maybe we can try something completely different.” The shop assistant said it would be fine to take the green rug home and try it out, and if it didn’t work then we could always exchange it for one of the red rugs. So with much reluctance, my husband agreed and the green rug came home. AND IT WAS ABSOLUTELY PERFECT! 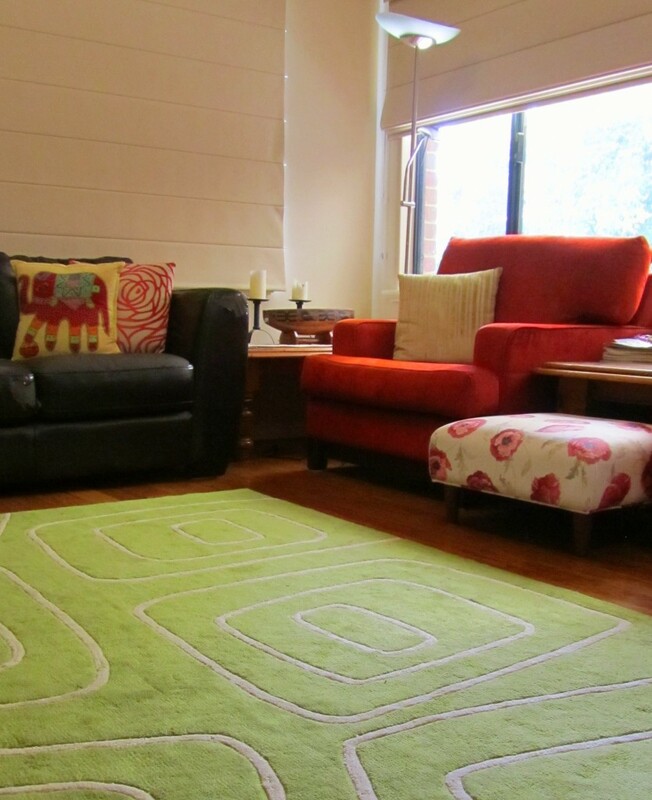 Samantha’s green rug completely changed the look of our living room. The new rug made the room sing. It was interesting, and fun, and colourful. And coolest of all, Samantha had left an indelible imprint on the fabric of our everyday life. I learnt two wonderful lessons that day. First, don’t be afraid of colour. Play with it, experiment, explore and try things. What’s the worst that can happen? You decide it doesn’t work and you try something else. Samantha wasn’t in the least afraid of her bold colour choice – in fact she was utterly convinced that it was right! Second, we could have ignored Samantha’s preference and in the process perhaps have dented her colour confidence. How awful to have been the person who caused her to question what felt instinctively right rather than giving her the confidence to stand by her choices. Instead, the rug story has become an intrinsic part of our family legend, and every time it is related Samantha stands just a little taller (in fact she was thrilled when I asked if I could share it here!). If you lack colour confidence now, then I can almost guarantee that somewhere along the line you were made to feel as though you weren’t “doing it right”. Perhaps you were told that certain colours should never be seen together, or that only creative artistic types are “good at colour”. Or perhaps you habitually compare yourself to others and your inner critic immediately pipes up with, “she’s doing it much better than I ever could”. When you were four or five years old you almost certainly made colour choices with cheerful abandon. I doubt very much that you worried that you “weren’t good at colour” as you sat busily colouring a fairy or an elephant. With all that said, I bet you still have colour favourites too – colours that you love and perhaps even colours that you hate. This is really important, because as you build colour confidence you are going to learn to trust your own colour STYLE. So let’s begin by regaining that sense of fun that you had a when choosing colours as a child. 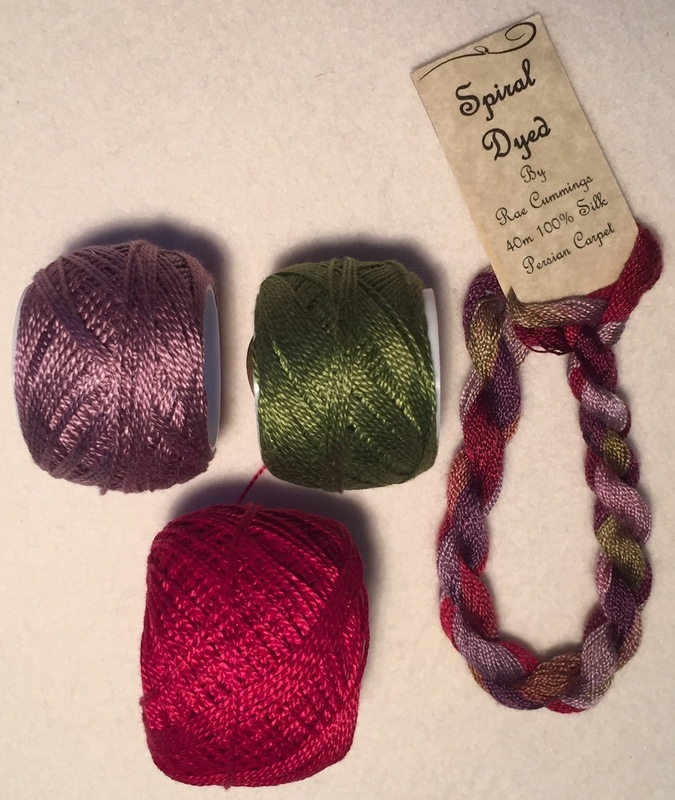 INTRODUCING MY SECRET WEAPON – VARIEGATED THREAD! Variegated threads – a cornucopia of colour! “What?”, I hear you say. Fear not – here is how it works. When I first discovered variegated threads I was like a kid in a lolly shop. I loved them all! I loved browsing a rack where a skein of regal purples, reds and greens hung next to a skein of warm, autumnal tones; mixed pinks and yellows jostled blues and greens straight from the ocean on a sunny day. My wallet suffered accordingly as I bought skein after skein of mixed colours, but what an amazing resource they turned out to be. You see, each variegated skein is a colour palette just waiting to be discovered. And you don’t have to worry about what colours go together – just take a single variegated skein and start working with it. 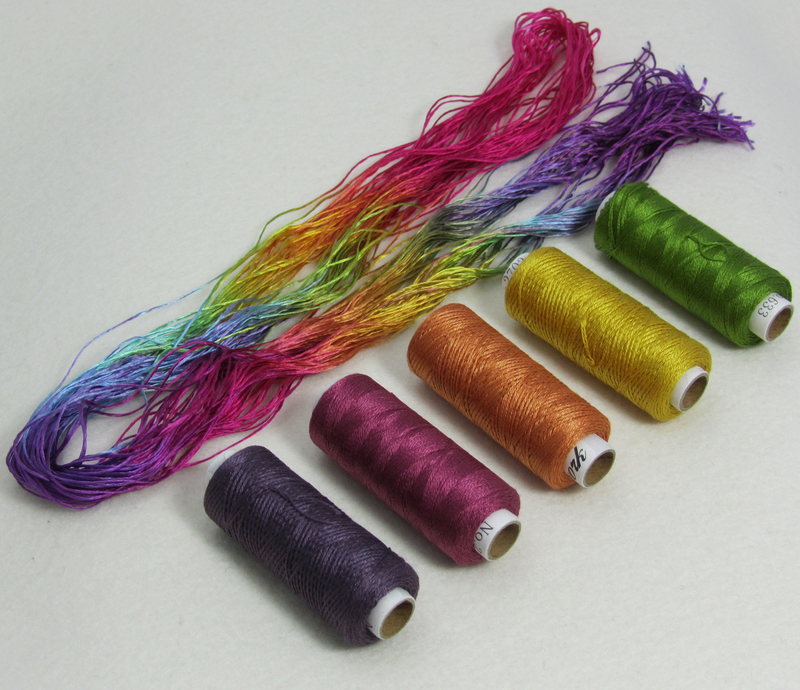 1) Choose a variegated thread with at least three distinct colours. This thread needs to make your heart sing – it needs to be one that you just want to start stitching because you love the colours so much. Here is one of my absolute favourites – Stef Francis Filament Silk 1-49. 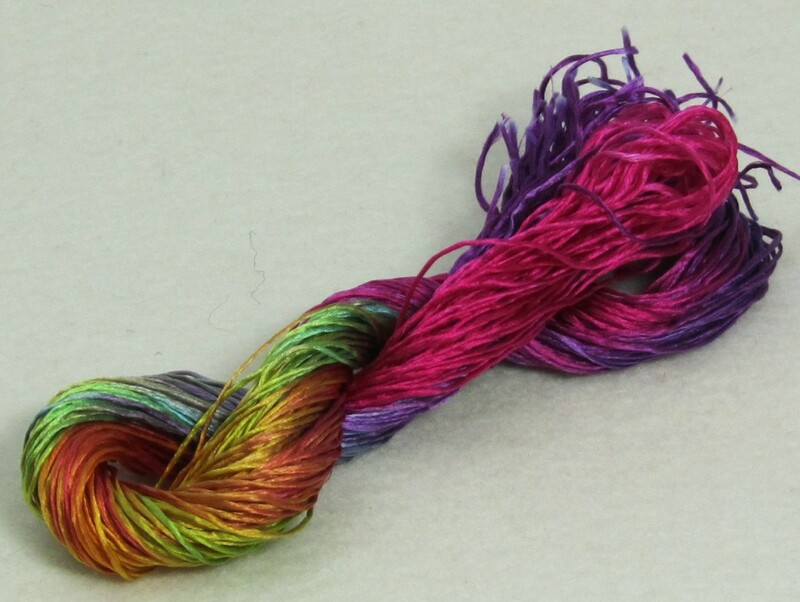 Filament silk takes the dye beautifully so the colours have a richness and a lustre which I love. 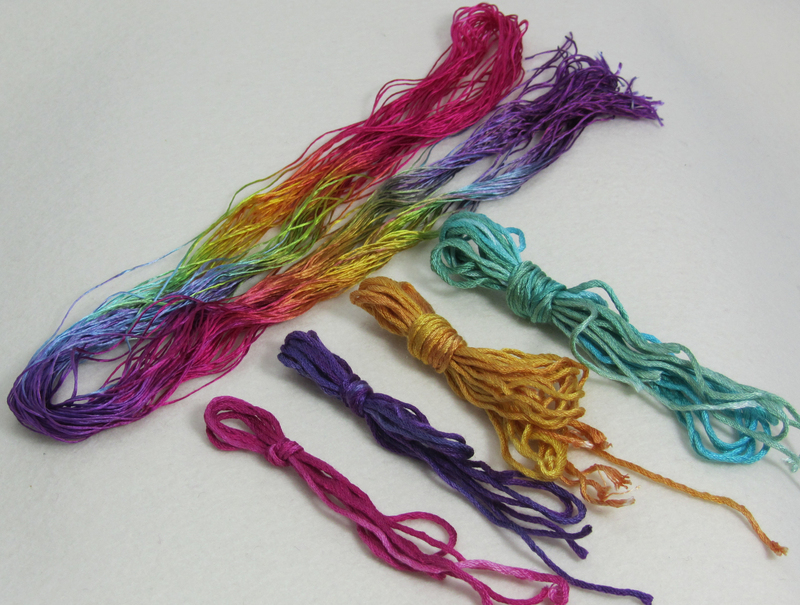 2) Start using your variegated thread as the basis for selecting a colour palette. If you look closely at the photo above you will see a rich pink, a delicate orange, a really warm yellow (not at all brash), mint green, a touch of teal blue and a lovely purple. Where these colours bleed into each other you get further colour subtleties – all of which are going to make your job easier! 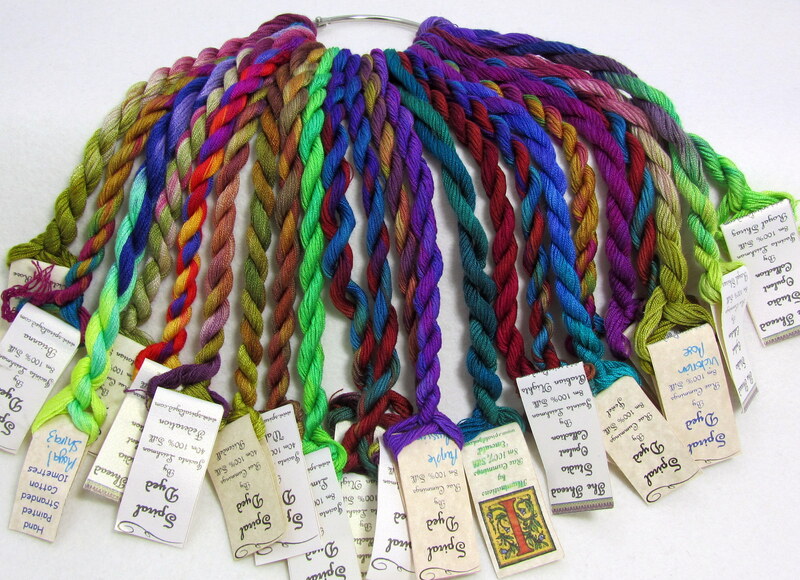 Now choose some single colour skeins that match the colours in your variegated skein. For this project, I selected pink, purple, yellow and a blue-green shade. A selection of colours from Stef Francis’ stranded silks to match the filament silk. You can see instantly that these colours work beautifully together. And why stop at just one set of colours! For example, here is another selection I made from my stash of Cosmo embroidery cottons. A palette of Cosmo embroidery cottons selected to match the Stef Francis fialament silk. This selection is different to the one above. I have chosen a much duskier pink which shows up on the filament silk where the pink bleeds into the orange. To match this I have toned down the purple shade. The single orange-yellow chosen above has been split into two distinct colours, and the blue has been replaced with green. The key point is that this colour combination STILL WORKS. 3) So now you have some lovely colours and all you need to consider is a little bit of balance. The original Stef Francis filament silk is predominantly pink and purple with smaller amounts of the orange, yellow, green and blue. You can use this to help you decide on where to use your colours. 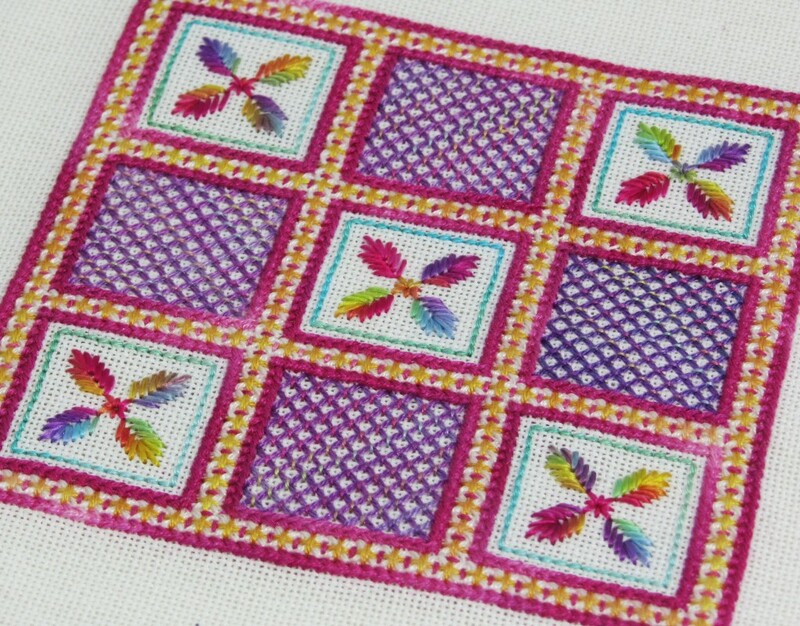 The little design below was stitched using the first of the two colourways above. I assigned pink and purple as my main colours, with yellow as a strong highlight and just a touch of the blue-green shade. And I used the original variegated skein for the floral features. It really is that easy. Without any colour angst at all, I have ended up with a pretty design that uses colours I love in a balanced and harmonious way. SO GO AHEAD – GIVE IT A GO! When you are choosing threads for your next project grab a pretty variegated skein in your favourite colours and just start playing. I guarantee that you will have fun and build your colour confidence. And when you are comfortable with this approach, head over to Part 2 of this series where we will take as our starting point a given colour. I promise it is just as easy as the method I have used here. And if you have a colour story to share me with me, then please leave it in the comments below. I love it when you share with me!